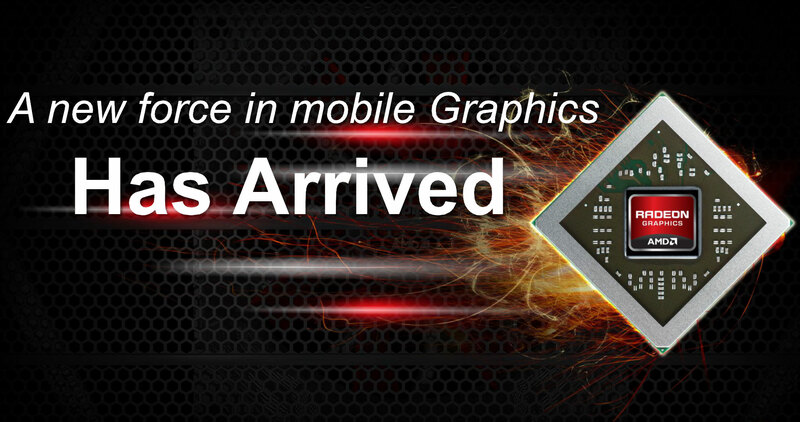 Late last year, AMD pushed out the first of their Southern Islands GPUs for the desktop, the HD 7970. Around the same time, AMD also announced their first 7000M mobile GPUs. 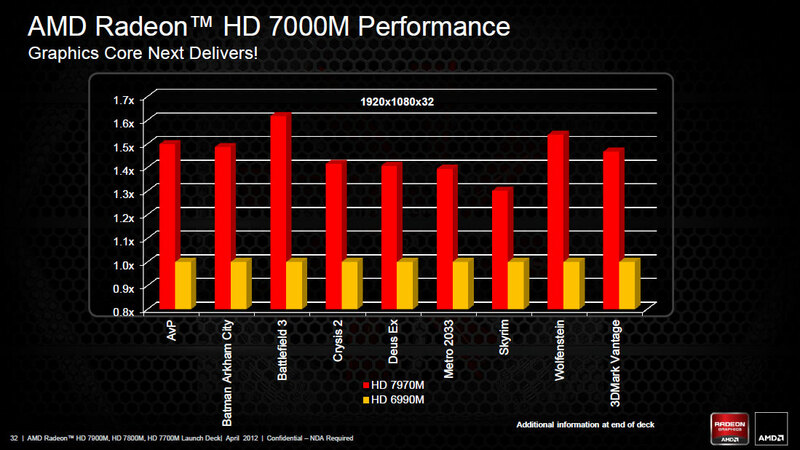 Since then, AMD has gone on to launch the HD 7950, the HD 7750/7770, and the HD 7850/7870. Meanwhile, on the mobile front we’ve had to sit back and wait…and wait. Today, the waiting ends, at least for one of the parts: the HD 7970M is now shipping in select notebooks, and the other GPUs will likely start showing up in other laptops and notebooks over the coming weeks. As is customary for AMD and NVIDIA, new GPUs debut on the desktop, and after a while they trickle down into the mobile world. 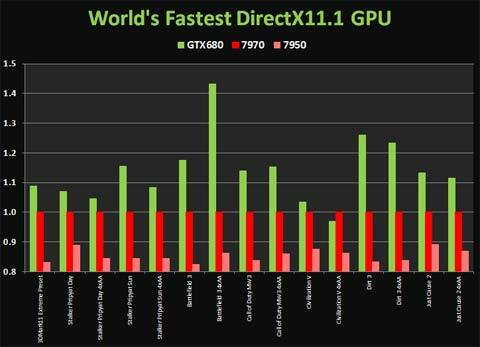 NVIDIA actually pulled a fast one with GK107 actually coming out ahead of the desktop GK104, which may be a sign of the changing times, but AMD’s GCN is sticking with the traditional route of using lower clocked power optimized versions of already launched desktop chips for their mobile parts. Not that there’s anything wrong with that from a business standpoint, but it does make laptop users feel like second class citizens. Before we continue the discussion, let’s list the specs. HD 6990M was certainly no slouch as far as mobile gaming is concerned; you can see how it stacked up against the GTX 580M in our Alienware M18x head-to-head in both single- and dual-GPU configurations. 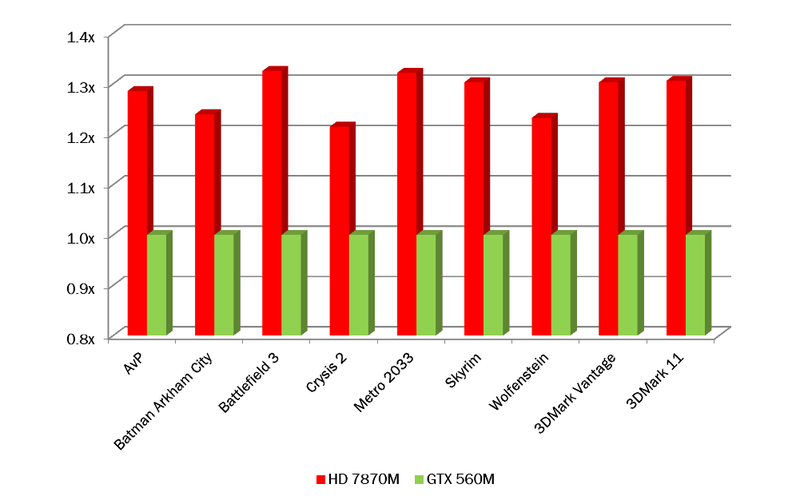 The quick summary is that across the eight games we tested last year, SLI GTX 580M averaged out to approximately 8% faster than CrossFire HD 6990M; for single GPUs, the result is more in NVIDIA’s favor: the GTX 580M was 8% faster at our Ultra settings, and 17% faster at our High settings. Assuming AMD’s numbers are correct (and given the amount of memory bandwidth and GPU cores we’re looking at, we see no reason why they wouldn’t be), it looks like HD 7970M will be around 45% faster than the HD 6990M on average, or about 25% faster than a single GTX 580M. 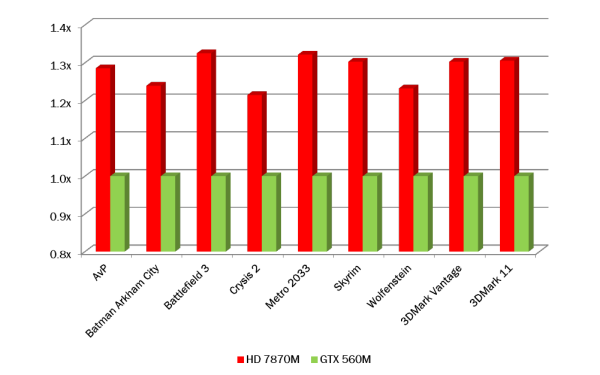 AMD also presented some data showing their estimate of performance results for HD 7970M vs. GTX 675M, which you can see below, though it appears that information was simulated using desktop hardware (Core i7-2600K) and while the numbers are likely accurate, the selection of games and the chosen settings could be debated. AMD obviously isn't an unbiased review source. Now we can wait for NVIDIA’s inevitable response with a high-end mobile Kepler. The other two GPUs are an interesting pair. Both use the Cape Verde core, but where the 7800M is a fully enabled 640 core part, the 7700M disables a couple compute clusters and ends up with 512 cores and 32 texture units. AMD also clocks the 7700M lower, most likely to hit lower TDP targets for laptops rather than because of inherent limitations with the chips. Compared to the desktop parts, the (presumed) HD 7870M will run the core at 800MHz vs. 1000MHz on the HD 7770 GHz Edition, and memory is at 4GHz effective compared to 4.5GHz on the desktop parts. For the (again presumed) HD 7770M, the core will run at 675MHz compared to 800MHz on the desktop HD 7750. And for the curious, once again AMD provided an estimate of performance for the 7870M vs. the GTX 560M (simulated using desktop hardware). Results are at 1920x1080/1920x1200 with a variety of quality settings, so take the following with a grain of salt. "The GPU clock is 850MHz compared to 1100MHz (stock) on the desktop HD 7870"
The 7870 is clocked at 1000MHz stock. I think its because it's a bit misleading visually. and hurts AnandTech for using the bad chart in their article. I had hoped the AMD marketing purge might have gotten rid of some bad players. Would be better if the vertical axis showed a gap before it intersects the horizontal axis. We are used to seeing the intersection of the axes as the origin 0,0. So just don't show a continuous axis, show a break or even a zigzag. Bar charts are harder, better to show a break or cut-off in the bars as well. As I comment below: Our text dissects the information, and right now these charts are the only indication of performance that we have. I just assume everyone who comes here is smart enough to read the charts and understand what they mean. I even say, "take the charts with a grain of salt."